Yes. Canopus would be useful, especially in those two weeks of daylight every month on the Moon. In daylight, unless carefully shielded, our eyes adjust for bright light, and only the brightest of stars and planets remain visible. Canopus should be visible during the day on the Moon. That's still 15° from the pole though so it would only provide a general check on compass direction. During the two-week lunar nights, it looks like there's a better choice. Did you notice that the Large Magellanic Cloud is only 5° from the Moon's south celestial pole? Of course astronauts would still be exposed to all sorts of artificial lighting. For example inside a rover, there would be many visual displays, and of course, if driving around, the vehicle would probably have very bright lights projecting in all directions. So even then, the LMC might be hard to see. An astronaut would have to shut off all the lights and wait a few minutes for dark adaptation. But then it might serve as a sanity check for an astronaut who has become confused or perhaps fears the automated navigation systems are being hacked or spoofed. That's the last stand for visual celestial navigation: a defense against navigational crimes. 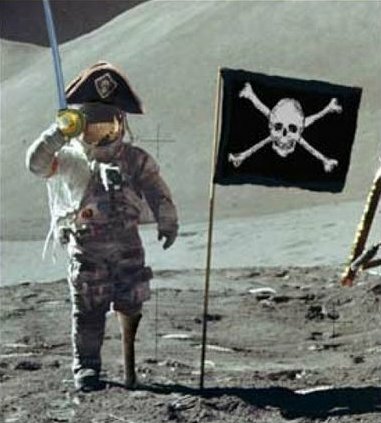 It won't happen soon, but eventually there will be Pirates on the Moon. Robert mentioned the librations. Most of the libration that we see from Earth is due to changing perspective, and on the Moon this does not affect the celestial sphere. Instead it adds a substantial wobble to the Earth's position in the sky (see PS). But there is a small "physical libration" --an actual wobble in the Moon's rotation. I don't remember the details but I believe this amounts to a few minutes of arc? I don't think this is modelled in Stellarium. PS: Select the Moon in Stellarium. Then, as before, ctrl-G to Go to the Moon. Now select a viewing location around latitude 0° and longitude about 75°. Then do ctrl-F to find the Earth. It should be near the horizon. Now call up the date selector, select the day number, and hold down the up arrow key on you keyboard. Days will fly by, and you can watch the Earth's position in the sky change over the course of years. The path is interesting! If you get closer to longitude 90°, you can watch the Earth rise and set, each event once a month.